Some of this great work came from the Ballcap Blog which I highly recommend. If anyone has any corrections or comments please let me know. Spalding is one of the earliest equipment makers dating back to the 1880’s, and had a major share of the market up to the 1950's. During the 1940’s war years, caps were manufacturer mostly in Canada. Mitchell & Ness was a distributor of Spalding caps for a time until around the 1950's. By 1949 or 1950, The Leslie Company acquired Spalding's capmaking business. Spalding continued supplying MLB caps made under private label, probably by American Needle, until the late 1950's. Spalding supplied flannel wool jerseys into the early 1970's, and made some of the first double knit jerseys to be worn on-field, but was gone from the MLB jersey market by 1973. Maker of baseball and sporting equipment since the 1880’s, Rawlings caps were worn by several teams, and were used into the early 1960’s. Rawlings supplied jerseys to the Cardinals and Browns since the early part of the 1900's, and to many other teams beginning in the late 1940's. Up to 1987, teams made their own jersey supplier arrangements, but from 1987-91 Rawlings became the first official jersey supplier to MLB teams and was allowed to display its logo on jerseys. It was not exclusive, however; during the Rawlings years, teams could wear jerseys from other manufacturers but they could not display any other manufacturer's logos on the jerseys. Most all teams did choose to wear Rawlings jerseys at this time. Partridge was a distributor based in Boston. They supplied caps and jerseys to the Red Sox into the 1950's and jerseys to the Boston Braves until their move. Did not manufacture themselves. A distributor based in St. Louis, Leacock supplied the Cardinals and Browns with jerseys and equipment in the early part of the 20th century. Sporting goods distributor based in St. Louis, supplied caps to the St. Louis Browns. Did not manufacture themselves. Supplied the St. Louis Cardinals caps in the early 1960's, their caps look a lot like New Era's to me. Philip Goldsmith immigrated to the United States from Austria in 1861. In 1869, He opened a toy store iIn Covington, KY where he bought toy dolls from Wolf Fletcher, owner of a small manufacturing and repair shop. In 1875 Goldsmith closed his business and became partners with Fletcher in his manufacturing operation. During slack times, Fletcher was in the habit of hand making baseballs from left over materials to make ends meet. They patented a baseball winding machine in 1876 and began to expand their sporting goods business. The partnership ended in 1878 with each starting their own competing businesses just blocks apart. Goldsmith continued to make dolls, baseballs and other athletic goods and became highly successful. His business went through a few name changes and locations in Covington, but was known as P.Goldsmith & Co. by 1890. Philip’s sons Oscar and Alfred became partners in the business in 1893, and a year later Philip died by drowning . The sons carried on with the sporting goods business and eliminated doll manufacturing. Alfred soon sold his partnership interest to another brother, Edgar. Their youngest brother, Hugo became a partner in 1906, the business name changed to P. Goldsmith & Sons Co., and they moved to a larger facility across the river in Cincinnati. GoldSmith & Sons tried mightily to get into the uniform market in the early 1900's and 1910's. They did become a presence in the evolving baseball glove market. Hugo turned out to be a manufacturing genius with many patents to his credit. He stabilized a notoriously seasonal industry by carrying 700 different products for every season and sport. In the throes of the Great Depression he bought out two struggling sporting goods companies, Draper Maynard and in 1936, Crawford McGregor & Canby Co. which made the popular MacGregor golf clubs and equipment. Attempting to boost their small share of the baseball market, in 1946 GoldSmith added the prestigious MacGregor name to their products and became known as MacGregor GoldSmith. The 1940’s was the peak of their cap making for major league teams. By 1953 the GoldSmith name was dropped entirely and the company was simply called MacGregor. By the end of the 1950’s, no MLB teams were using their caps; MacGregor jerseys remained popular into the 1960's. MacGregor-labelled caps re-appeared on MLB fields again briefly, when they acquired Sports Specialties in 1986 before selling it in 1987 (see below). Wilson got into the athletic uniform business when it acquired Hetzinger Knitting Mills in 1915, striking a deal to supply the Cubs in 1918. Wilson jerseys and caps were worn by many teams over the years. Wilson became a dominant MLB cap supplier during in the late 1950’s following the 1954 introduction of New Era's 5950 cap, as New Era made Wilson's caps under a private label arrangement through 1974. In the late 1960’s New Era decided to phase out private label manufacturing, and by 1975 Wilson had turned to American Needle. Only a couple teams continued using Wilson caps after the mid 1970's, Atlanta and lastly Philadelphia in 1987. Wilson jerseys remained popular with MLB teams until the 1987 MLB licensing arrangement with Rawlings. Tim McAuliffe got his start as a distributor of caps in the late 1930's. He was first to sell caps with buckram stiffener behind the front of the crown. I am not sure who made those early caps for McAuliffe as he was not a manufacturer. Tim McAuliffe's rise to prominence began around 1940 when he became distributor to the Red Sox, first for Spalding jerseys, then Wilson jerseys later in the 1940's. McAuliffe eventually began distributing caps made by Spalding, and also started his own cap label, with some McAuliffe caps distributed by Mitchell & Ness. Around 1949, McAullife caps were made exclusively by The Leslie Company, owned by Jacob Kaufman, and sold under the Tim McAullife label (the 24 Lincoln St. address was added to tags in 1951). And by 1952 he had an exclusive deal with Stall and Dean (established 1898) to make jerseys under the Tim McAullife Inc. label. In 1952, McAullife and Kaufman introduced the "KM Pro" model, KM meaning Kaufman-McAuliffe. In 1953 Kaufman applied for the KM Pro trademark, and from July 1953 onward caps had "KM Pro" stamped into the sweatband. With demand growing fast, some McAuliffe caps were made by New Era in the late 50's-early 60's. From the mid- 1950's to mid- 1960's, Tim McAuliffe (and Wilson) caps were the dominant brands used by MLB teams. However, by the late 1960’s, New Era (maker of Wilson caps) had gained the largest share of the MLB cap business under both the Wilson and New Era labels. Tim McAuliffe's business closed in late 1968 or early 1969 when Mr. McAuliffe passed. Jacob Kaufman's newly formed Leslie Company took over Spalding's cap making business around 1949 or 1950. He soon partnered with Tim McAuliffe, who was rapidly gaining business as a distributor to MLB teams, and by 1953 the pair had introduced the KM Pro model cap to MLB (side note - Kaufman also patented the cardboard insert in 1956). In addition to making caps under the McAuliffe label, KM Pro caps were distributed by Mitchell & Ness into the mid-1950's, and were manufactured for Wilson. From the mid-1950's to mid-1960's KM Pro caps were used by every team at some point. After Tim McAuliffe closed in 1969, Leslie continued making caps for MLB teams, changing the McAuliffe label to a KM Pro label. But in the early 1970's, New Era had virtually taken over the cap market. KM Pro closed in late 1976, and its equipment was sold to New Era, to statup Devon Professional Cap, and to Roman Art which then started the Roman Pro cap label. Stall and Dean made MLB jerseys under the Tim McAuliffe label since the early 1950's. When Tim McAuliffe Inc. ceased operations in 1969, owner Richard Stall keep the name's goodwill going, creating McAuliffe Uniform Corp. to carry on manufacturing MLB jerseys. McAuliffe Uniform also distributed and repaired caps in the mid 1970's under a "Pro McAuliffe" tag. The last MLB McAullife Uniform jerseys were worn by Oakland in 1981. A set made for 1982 was never used. Stall sold the company in 1996. New Era was established in 1920 and first supplied caps to an MLB team (Cleveland) in 1934. With the introduction of the 5950 cap in 1954, New Era quickly became a major manufacturer of caps sold under the Wilson label, and to a much lesser extent, under the Tim McAuliffe label. Interestingly, The Leslie Company also made caps for New Era in the early 1960's. Throughout the 1960’s New Era gained business under their own label, and by 1974 was producing New Era labelled caps for 20 of the 24 MLB teams. Not sure what year New Era was granted "Official Licensee" status, but the "Official Licensee" tags (with the "Batterman Logo") appeared in 1981, sewn onto the sweatband inside the cap. MLB granted New Era a co-exclusive license (along with Sports Specialties) for on-field caps for the 1987 season, giving rise to “Diamond Collection” labels inside New Era caps (changed to the “Authentic Collection” in 1999). In 1994, New Era was granted an exclusive license through 2014 to make caps for all MLB teams. With the demise of Roman Pro in 1994, New Era was also granted a co-exclusive license to make “Cooperstown Collection” throwbacks. 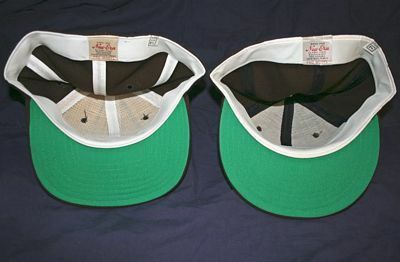 New Era on-field caps were first mass sold to the public in 1978 (prior to that, most caps sold to the public were ANNCO's rayon/metal eyelets/logo on a patch). Around the late 70's a different style cap was made to meet the demand from this new retail market. This cap has a squared brim, white fabric (non-satin) taping, thinner logo embroidery, and usually no plastic liner (reed) on the bottom of the sweatband; see photos below. These caps were generally NOT used on-field - but never say never, I have seen an Angels and an A's game-used cap in this style. New Era did not sell them as a 5950, and in fact used a different model number for this style (though I don't know what it was). By the late 1980's it seems this style was exclusively used to make adjustible-back caps. The Ballcap Blog has an excellent article on these caps. The cap on the left in each photo is the retail version; on the right is the on-field 5950. New Era also repaired and refurbished caps of all makes in the 1970's, which is why you might see a KM Pro-made cap with a New Era sweatband and label. Roman Manufacturing Corp. was started in 1936 by Larry & Olga Mazzola creating monogramming for linens, handkerchiefs, etc. The company soon became Roman Art Embroidery Corp., eventually becoming a major source of embroidered logos for pro uniforms and caps by the mid 1950's. McAuliffe/Leslie/KM Pro and Wilson used Roman’s embroidery for their caps and uniforms. When Leslie/KM Pro closed at the end of 1976, some equipment and inventory was sold to Roman Art, which created the Roman Pro label and began making their own caps. Alhough Roman Pro made caps in all team styles, only a some teams (Atlanta, Boston, Baltimore, Houston, LA Dodgers, Milwaukee, Montreal, NY Mets and NY Yankees are the ones I've seen) actually used Roman Pro caps on-field in the late 1970’s and early 1980s. Some 1977 caps were clearly made by Leslie/KM Pro (must have come from their inventory) but have Roman Pro labels. In addition to making on-field caps, owner Bob Mazzola had the patterns (from his father) of team logos they'd embroidered for KM Pro over the years. Seeing a market opportunity, Roman worked with MLB to develop "official" (but not entirely accurate) throwback logos and in 1986 won the first license for "Cooperstown Collection" throwback caps. Despite this cooperation, in 1987 MLB handed a co-exclusive license to New Era and Sports Specialties for on-field caps which suddenly shut Roman Pro out of the on-field market; Roman did get a co-exclusive license for “Cooperstown Collection” caps. Roman’s quality deteriorated significantly in the 1990’s, and in 1994 the company closed. Though resurrected as Apparel 2000, the new company has no involvement with MLB. When Leslie/KM Pro closed, some equipment was acquired by Harold Aronson (formerly of KM Pro) who founded "Devon Professional Cap" in 1977. The only MLB teams to use Devon caps during the season appear to be Boston and the Mets in the late 1970’s-early 1980's. Dodgers and Brewers caps exist as well but are likely spring training caps. Twins Enterprises bought Devon in the mid 1980's. Twins Enterprises began in 1947 selling pennants and memorabilia around Fenway Park. Twins became a licensee to MLB in 1979 and produced on-field style caps but as far as I know, only the Red Sox have worn Twins caps on field. Twins bought Devon in approx. 1987. Several years ago, Twins changed its name to '47 Brand and today produces franchise style and Cooperstown Collection caps. Founded in 1928 by David Warsaw, Sports Specialties Corporation was the first company to make products under license from a pro sports team (Chicago Cubs) and is the inventor of the bobble-head doll. By the 1960’s Sports Specialties was the world's leading licensed sports headwear company. Sports Specialties became an official licensee for MLB caps in 1984 supplying their wool caps, “The Pro". These were mostly manufactured by the Young An Hat Company in Korea and are recognizable by their thick wool, flat embroidery, and short, square visors. Some were made in the USA at a plant in Winslow, AZ. 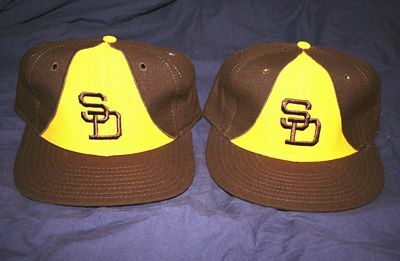 In 1986 Sports Specialties and New Era were granted co-exclusive licensing for MLB caps (under the "Diamond Collection" label), making them the only two makers of on-field caps. More than half the MLB teams used Sports Specialties caps from the mid 1980’s through 1993 (Baltimore, Boston, Chicago Cubs, Cincinnati, Colorado, Detroit, Florida, Houston, Milwaukee, Minnesota, NY Mets, Oakland, Philadelphia, San Diego, San Francisco, St. Louis, Texas are the ones I've seen). But Sports Specialties never gained much of a following with MLB teams, and in 1994 New Era won an exclusive license to supply on-field caps to all MLB teams. Sports Specialties continued making MLB caps for several years for retail only, which were now 80% acrylic and without an MLB label inside or the batterman logo on the back. Sports Specialties was bought by MacGregor Sporting Goods Inc. in 1986, sold to the Oppenheimer-Palmieri Fund L.P. in 1987, and then to Nike in 1992. They left the MLB cap market at the end of the 90s, but rumor has it Nike is interested in the MLB contract once New Era's exclusive license expires after 2014. Founded in 1918 as an importer of sewing needles, American Needle evolved into a major headwear manufacturing company. In 1946, the company approached the Chicago Cubs with the idea of selling fans souvenir caps like the ones the players wore on the field. The Cubs agreed to the proposal, with the team’s ownership noting, “Who would want to buy the hats that the players are wearing?” The first run of Cubs hats sold out in one day and a second lot sold even faster. Soon the company was supplying souvenir melton felt caps with metal eyelets and sewn-on-patch-logos to fans of all MLB teams. In the 1970's and 80's, ANNCO also supplied on-field caps under the Wilson label. Jumping into the fast-growing throwback market, ANNCO was granted a co-exclusive license around 1986 to make “Cooperstown Collection” throwbacks, the accuracy of which is debatable. When the Baltimore Orioles added white and orange front panels in 1975, their primary cap maker, Wilson, had just been forced to switch from New Era to ANNCO due to the former's ending of private-label manufacturing in 1974. So they selected local cap maker AJD, which introduced the only double knit polyester caps ever used in MLB. Worn only 1975-77, the Orioles are the only team to have worn AJD caps on-field. Founded in 1904 as a sporting goods distributor, M&N distributed Spalding and KM Pro caps to MLB teams in the 1940's and 50's, and supplied the Philadephia A's with Pearson jerseys in the early 1950's. But by 1983 the company nearly went under and was down to a single store with the owner and his wife. In 1985 a customer walked into the store and requested a couple old MLB wool flannel jerseys be repaired, triggering the idea that they might manufacture throwbabcks. Researching old designs and finding a stockpile of neatly packaged 50 year old wool flannel, M&N started making throwback jerseys. In 1988 they won the exclusive license for jerseys and a co-exclusive license for "Cooperstown Collection" throwback caps. M&N partnered with Ebbets Field Flannels to make the caps; Ebbets Field in turn used Roman as a contractor in the early 1990's (with Ebbets Field specs), then later California Custom Caps. M&N Cooperstown Collection caps and tags were styled to resemble KM Pro. After M&N stopped their collaboration with Ebbets Field, quality deteriorated. M&N lost their license to make Cooperstown Collection caps in 2003, but remains a force in throwback jerseys for all major pro sports. Adidas bought M&N in 2007. Based in Philadelphia, Pearson supplied the Athletics jerseys, distributed by Mitchell & Ness (see above), in the early 1950's. L.A. based Goodman made jerseys for the two LA teams, the Mets and a couple others in the 1970's and 80's. Founded in 1902, Russell Athletic jerseys appear in 1992, as the company followed Rawlings as the official MLB uniform supplier from 1992-99. As with the Rawlings contract, during the Russell years teams could wear jerseys from other manufacturers but could not display that manufacturer's logo on the jerseys. Many teams continued to wear Russell into the early 2000's. A small sports uniform maker based in Southern California, A.I.S. started in 1984 and noted for making authentic-looking uniforms for sports movies. From 1995-99 A.I.S. supplied the Mets. At that time the Mets were on the verge of a complete redesign to incorporate black as their main color. However A.I.S. convinced the team to retain its tradional look and incorporated black drop shadows instead. Majestic became the official MLB supplier in 2003. Teams contracted to other manufacturers were allowed to continue those contracts through 2004. Majestic has been the exclusive uniform supplier to all MLB teams since 2005. Cooperstown Ball Cap made very authentic-looking throwback MLB caps from 1987 until 2010 when it closed due to licensing and trademark issues. It resurrected shortly afterward in a working arrangement with Ideal Cap but no longer offers MLB caps from any period.